Certainly one of the most anticipated albums of 2015, “Book Of Souls” is the first double album in the stellar career of these British heavy metal champions. Recorded in the same Paris location as their hugely successful comeback record, “Brave New World” (2000), this monumental piece of work collects 11 songs for 92 minutes of music in which almost every second sounds essential; a stunning artistic achievement for sure, and one of their finest hours and a half. What really sets apart Iron Maiden from the rest, is their strong will to evolve, to look for new paths without repudiating their roots and their defining style, to not compromise; and all this really gave them the position of supreme kings of metal they have today and shines throughout “Book Of Souls”. But beware, this double album will take repeated listening and a good deal of your precious time, like those old masterpieces used to do, like when we were kids and we were hungry for dreams and shivers. “If Eternity Should Fail”: The opening track of disc 1 is so well conceived you almost don’t notice is more than 8 minutes long; from the atmospheric intro, through the melodic cathedral built up by the three guitars, it delivers one of the best chorus of the records and a nice acoustic guitar final that brings us back to the “Seventh Son” era. “Speed Of Light”: The first single is a fast rocker with a huge guitar riff, courtesy of Mr. Adrian Smith, and an amazing vocal performance by Bruce Dickinson who channels all his love for Ian Gillan on this flaming nugget of a song. The twin guitars riffing is so precious it makes this track a real gem in its simplicity. “The Great Unknown”: There are two tracks on this double album that sound to me a little bit like leftovers from previous albums, and this is one of them; from the usual slow intro, the song builds up to the usual tempo changes and usual hooks. For sure, the performance of the band is overall competent and the guitar department does a nice job but, in this collection of killer songs, “The Great Unknown” sounds a bit…not killer enough. “The Red And The Black”: Luckily, everything changes with this 13 minutes monolith: written by Steve Harris, its development surprises at every turn. With almost no recurring part, it’s a melodic guitar fest, with tons of riffs and melodies weaving together, underlining the vocal parts or exploding in full flight in the final six minutes; again reminiscent of “Seventh Son”, in this case the song, it is for sure one of the highlights of “BOS”, and of their career, and it leaves you with the desire of listening to it again and again. “When The River Runs Deep”: A break in the intensity set by the previous song, “When The River…” is a short n’ fast number starting with a great riff and counting on a great performance by Bruce Dickinson delivering some really memorable lines; the idea of slowing down the chorus somehow makes it even stronger and catchier. Thumbs up once again for the guitars of Smith, Murray and Gers that didn’t sound this inspired since 1988. “The Book Of Souls”: It’s time for the title track and it’s time for another classic: sit down, relax, put your headphones on and let Maiden guide you through this fascinating musical journey; part “Dance Of Death”, part “Losfer Words”, Gers and Harris conceived an epic that will rivet your ears for infinite listening. Magniloquent in the using of keyboards parts, what really shines throughout is the almost endless inspiration that sets the guitar riffs alight. The fact that Dickinson was suffering from what the entire world now knows, makes its performance even more astonishing: these guys are getting better and better with every passing year, and for a singer, well, it’s not human. “Death Or Glory”: The opening salvo of disc 2 is another fast paced rocker that will go down extremely well in the forthcoming tour, and probably the best one they wrote since “Aces High”. 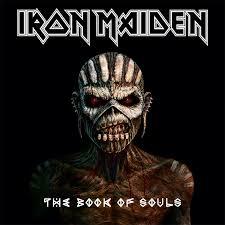 If this was chosen as debut single, I think a lot of people would have approached “Book Of Souls” with different attitude, but we all know that Maiden don’t care much for the obvious choices. “Shadows Of The Valley”: This is simply…perfect. All the best elements of new century Maiden are here, flowing fluid and inspired; again an almost 8 minutes song that sounds like it’s 4 minutes long, since every element is in the right place, without worthless repetitions. You will find yourself waving your arms in the air for the crowd in your living room. Epic! “Tears Of A Clown”: Written about the death of actor Robin Williams, this is another great song with an even greater chorus, simple as that. I can see this becoming a live favourite. “The Man Of Sorrows”: There must be a reason why Dave Murray wrote so little in the history of the band, and this is a good example. A song that was not particularly necessary, in a second disc that is exclusively made of classics this sounds even more “by numbers”. Anyway, the man is a killer guitar player and I’ve got to praise his fluid and consistent guitar leads, saving the song somehow. “Empire Of The Clouds”: There’s been a huge debate about this one, even before hearing a single note. An 18 minutes long epic? Are you nuts? I don’t have time for that!…this pretty much summarizes the common cultural and social landscape we live in; these are the years you’ve got just to pass through the void, possibly faster. Well, take your time ladies and gentlemen, because this is a Masterpiece, and is going to haunt you since first listening. When lyrics and music merge together to create a visual, almost cinematic result, that’s where songs like this are born; with all the sections flowing naturally one after another, linked together by Dickinson’s piano playing and orchestral arrangements, Its almost impossible to describe with words what the band creates in this mastodon of a song. One of their crowning moments, for sure, this is Art, not just rock n’ roll.